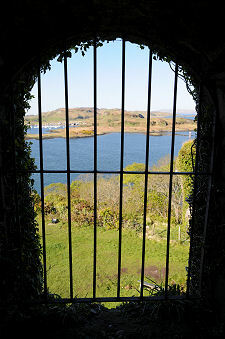 Dunollie Castle, for centuries the most important fortress of the Chiefs of Clan MacDougall, perches on the summit of a 90ft high outcrop of rock that guards the narrow passage into Oban Bay between the mainland and the north end of the island of Kerrera. Anyone sailing into or out of the bay cannot fail to notice it: and, of course, be noticed by anyone occupying it. Scotland has a number of castles built in apparently impregnable locations, and Dunollie must certainly be counted amongst them. When seen from the seaward side, the rock appears to be sheer on all sides and you could be forgiven for wondering how a modern visitor could possibly access the castle. The answer lies to its rear, at Dunollie House. You can still find online, and doubtless printed, guides that talk of reaching the castle by means of a steep climb from a small layby on the road that skirts the foot of the rock (an approach that is now closed) and it was certainly the case that for a long time the castle was effectively abandoned to the encroaching vegetation. More recently, however, the obvious potential of Dunollie as a visitor attraction has been turned into reality and the castle, the grounds and parts of nearby Dunollie House are now open to the public on a more formal basis. Today's visitor can drive as far as the car park at the top of Dunollie's access road and proceed from there through grounds that being developed to add to the attraction of a visit. Or you can walk along the old carriage road that runs for about three quarters of a mile to Dunollie from near the Corran Halls in Oban. It is also possible to walk along the Corran Esplanade and the Ganavan road, but the footpath runs out a few hundred yards short of Dunollie, and the carriage road is probably a safer option as a result. Visitors are directed away from the frontage of Dunollie House, which remains a private residence and the occupants' privacy should be respected, and around to the rear of the building, where ranges of buildings line two sides of a lawn. The range in front of you, though it later became servants quarters when Dunollie House was enlarged, was built as a family residence in 1745 when the castle was finally abandoned as a viable home. Its date of construction means it is referred to as the 1745 House. This part of the house underwent extensive restoration in 2011 to return the interiors to those of a laird's residence in the 1700s, and today it is possible to tour the 1745 House and get a feel for the life the MacDougall's led after abandoning the castle, as well as a glimpse of its time as servants' quarters. The 1745 House is also home to the "Mirror of History" exhibition. This allows visitors to appreciate the Hope MacDougall Collection, a nationally important collection of five thousand objects collected by Miss Hope MacDougall, who was daughter, sister and aunt to three successive chiefs of the Clan MacDougall and grew up at Dunollie House. The collection looks at working and domestic lives of people living in Argyll, alongside comparative objects from elsewhere in the world. The single storey range to your left as you approach the 1745 House dates back at least as far as 1617. 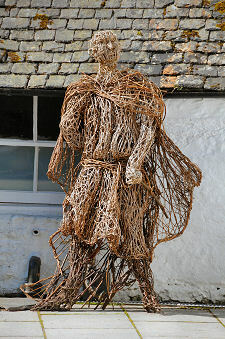 This was known as the Laich Biggin or "Low House". This houses further exhibition space and a gift shop. Visitors can also enjoy the catering on offer at the nearby Kettle Cafe. 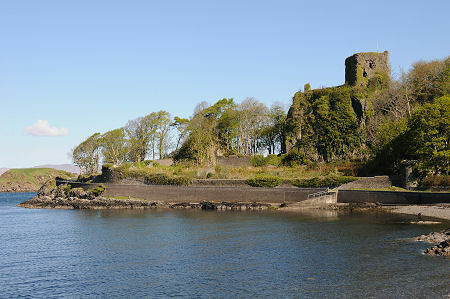 Work is currently underway to consolidate the structure of Dunollie Castle and ensure its long term future. What this means in practice is that elements of the description that follow may change, or may already have changed by the time you visit. From the rear of Dunollie House, you follow an uphill path to the castle. The surrounding trees only give the slightest of hints that you are approaching Dunollie Castle before you suddenly arrive at its north eastern corner. This is the only moderately graded approach to the castle, and it's not immediately obvious that there are sheer drops on every other side. It soon becomes so, however. The structure you face as you arrive is the rear wall of Dunollie Castle's keep. If you follow this around to the north, the keep blends into the north wall of the castle itself, and the ground drops away ever more steeply. Visible a little further along the north wall, just before the Heras fencing that prevents visitors proceeding to the point at which the drop becomes sheer, is the outer end of what was once the castle's postern gate. This originally formed a zig-zag passage within the enormous thickness of the wall, but has since been blocked up. To enter the castle you head the other way, along the eastern wall to a gateway whose surrounding stonework is partly supported by the more recent addition of scaffolding poles. Once through the gate you are in for a surprise. What you find is a grass covered courtyard that is not far from being a perfect square, measuring some 90ft from north to south by 88ft from east to west. The north and east walls were always much larger than those above the cliffs on the south and west sides of the courtyard, and today they remain complete up to a height of 15ft in places. The west and south walls would only have stood as high as was needed to prevent occupants falling over the cliffs, or, on the west side, as high as the buildings that would once have lined this side of the courtyard. Other buildings once ran along the east wall of the castle, and between them the east and west ranges would have provided space for a great hall, kitchens, service quarters and accommodation for residents other than the clan chief and his immediate family. Today all that remains of these two ranges is a two storey length of wall standing close to the north west corner of the castle. Otherwise it is wire fences and encroaching vegetation that prevent visitors from getting too close to the sheer drops on the west and south sides. 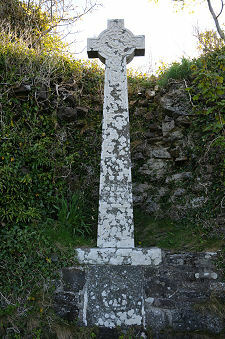 Set close to the end of the east wall is a fine memorial cross. The most impressive structure still standing at Dunollie Castle is the keep, which stands at the north east corner of the castle, set diagonally and defending the only easy approach. The keep measures, externally, some 39ft by 37ft, and has walls of between 9ft and 11ft in thickness. A doorway on the south west side leads into a vaulted ground floor chamber that would probably have provided secure storage during the castle's active life. There are traces of two slit windows, one on the south west wall and one on the south east, both looking out into the courtyard. A staircase set within the thickness of the wall leads up to the first floor of the keep, which would have provided space for the Lord's Hall, or living quarters. It is likely that the main means of access to this part of the keep would originally have been by means of an external wooden stairway that would have been removed in times of great danger. The hall is now open to the sky, but there was originally a further floor, providing bedrooms for the clan chief and his family. It is difficult to see them today, but traces have also been found of defensive works to the north and east of the castle, guarding the rest of the summit of the rock. Rather more obvious are the lengths of castellated wall alongside the Ganavan road and elsewhere at the foot of the rock on which the castle stands. These appear to be landscaping features added much later, rather than anything that would be recognised by the occupants of the castle. Evidence has been found that suggests that the rock on which Dunollie Castle stands was fortified as early as the years around 700, when the area formed part of the Scots Kingdom of Dalriada or Dál Riata. Traces have also been found of a defensive structure built on the site in the 1200s. It is likely that this was built by Ewan MacDougall, also known as Eóghan of Argyll, the third chief of Clan MacDougall and the great grandson of Somerled. The castle whose remains you can see today probably dates back to the early 1400s, though the west range may have been added a century later. Clan MacDougall lost its grip on Dunollie after opposing Robert the Bruce in the early 1300s, but later had its lands returned to it. The clan's estates were again forfeited when the 22nd Chief of the Clan MacDougall, Iain Ciar, backed the losing Jacobite cause in the 1715 uprising. They were returned to Alexander MacDougall, 23rd Clan Chief, following the defeat of the 1745 uprising. By this time Dunollie Castle was in a ruinous condition: and in any case was hardly fitted for the needs of a modern laird and his family. It was Alexander MacDougall who built what is now called the 1745 House. The house at Dunollie was extended by the addition of a north wing in 1780, and what is now known as Dunollie House was built, adjoining it to the south and west, in 1838. 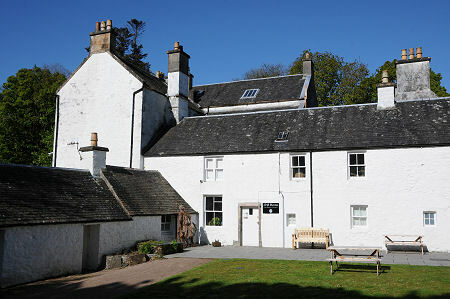 Dunollie House, Oban, PA34 5TT.